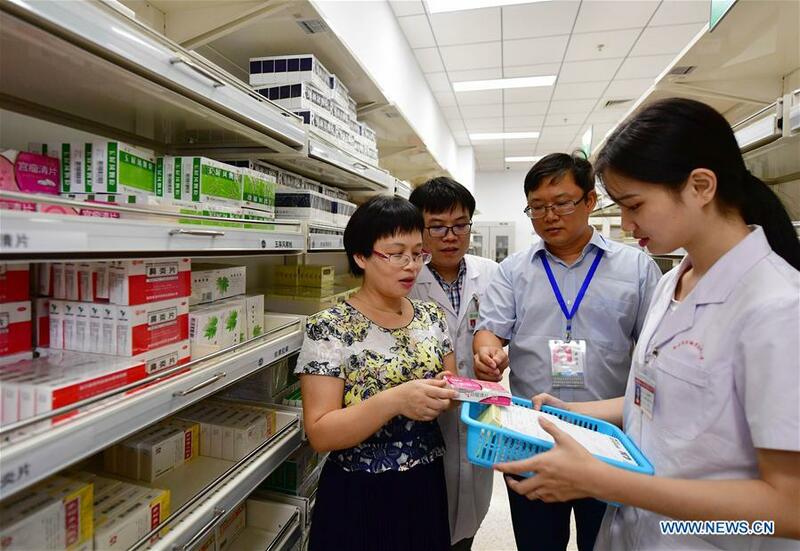 BEIJING, Oct. 22 (Xinhua) -- Chinese lawmakers began reviewing a draft amendment to the Drug Administration Law on Monday, which toughens penalties for offenders as the country cracks down on counterfeit drugs and better regulates the industry. The draft, submitted for the first reading at a bi-monthly session of the Standing Committee of the National People's Congress, came a week after Changchun Changsheng, a Chinese pharmaceutical company, was hit with a 9.1 billion yuan (1.31 billion U.S. dollars) fine for producing faulty human rabies vaccines. "The revisions highlighted heavier punishments and strengthened whole-process supervision," said Jiao Hong, head of the National Medical Products Administration (NMPA), when presenting the draft to the lawmakers. According to the draft, supervision of drugs will be further tightened and expanded to cover the whole process, including raw material supply, manufacturing and pre-sale examination. The draft introduces a "full traceability" mechanism and a drug recall system. To address problems laid bare by the vaccine scandal, the draft underlines the management and supervision of vaccines. It identifies vaccine, blood products and anaesthetic drugs as special medicine products, which are not allowed for sub-contract production, and requires "vaccine license holders" to get their products covered under compulsory insurances. Moreover, manufacturers who fail to discover or remove drug safety risks will be subject to suspension of production and sales. The draft also proposes a drug safety credit system to timely update and publish drug safety information, including manufacturing permits, results of daily inspections and violations. Though Chinese regulators have strengthened measures in recent years, counterfeit or sub-standard drugs still exist, a problem some industry watchers have attributed to weak punishment. Li Jiang, an NMPA legal adviser, said the draft amendment had comprehensively toughened punishments. According to the draft, both the lower and upper limits of penalties will be increased. For instance, those who engage in drug manufacturing or selling without a license will be fined five to 30 times their earnings, as opposed to two to five times currently. In addition, the draft stipulates several occasions where heavier punishment is applicable, including making and selling faulty vaccines, as well as making and selling counterfeit or sub-standard drugs for pregnant women and children. On the Changchun Changsheng case, Li told Xinhua in a previous interview that "serious punishment for the case will serve as a warning for drug safety and shows the authorities' resolution to crack down on drug violations and protect people's health." The draft also sets to amplify the personal risks for perpetrators. Those involved in counterfeit drug cases, such as legal representatives of a pharmaceutical company and those directly in charge of manufacturing, will be fined or banned from the industry, according to the draft. Aside from clamping down on making and selling counterfeit drugs, the draft aims to spur innovation and reduce inefficiencies by introducing a "marketing authorization holder (MAH)" mechanism. The MAH rule, which was introduced by the State Council in a three-year pilot reform in late 2015, expands those eligible to acquire drug manufacturing licenses, from pharmaceutical companies to drug researchers and institutions. "The pilot reform has proved that the MAH rule is feasible and productive," said Liu Pei, another NMPA official in charge of policy and regulations, adding they plan to ask for an extension of the pilot program until the draft amendment is adopted. The draft amendment, however, adds more stringent rules to the MAH mechanism, such as requiring holders to continue evaluating drug safety and effectiveness even after the drugs hit the market.